We are happy to work on projects both large and small. Have a look at some of our latest ones. School of Psychology, Cardiff University, with funding from the Wellcome Trust Institutional Strategic Support Fund and Alzheimer’s Research UK. We are currently involved in a collaborative project with Kim Graham and her research team on developing tasks that are behavioural indicators of the later development of Alzheimer’s and semantic dementia in people with known genetic disorders. Our role in the project is to work with the research team to specify, design and develop a prototype application, initially for web-based administration of the tasks. The system will be designed in such a way as to enable the migration to touch-screen tablets, to extend the languages beyond English, and to allow for new tasks to be included as required by the team. More details will follow as the project progresses. 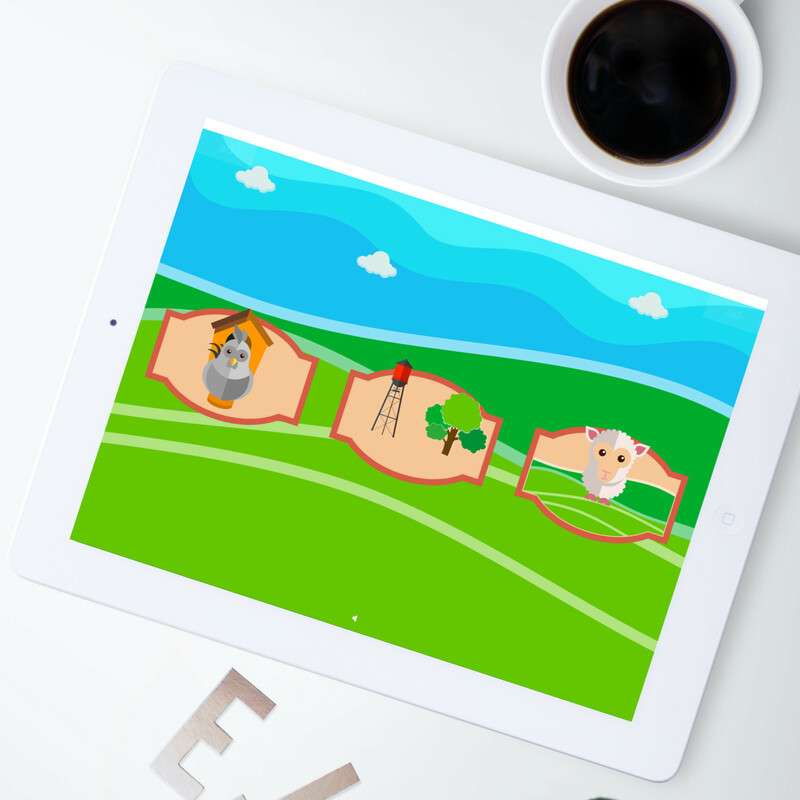 Sheep Game: This is a Go-NoGo task where the child is asked to respond to sheep images, and to withhold responses to pigs. The child is rewarded for a tap on a sheep by hearing a “baaa” sound and seeing the sheep jump into a field. The rewards accumulate and show more and more sheep appearing in a field over multiple game runs. This game adapts by varying the presentation duration of the stimuli based on performance on the NoGo trials. 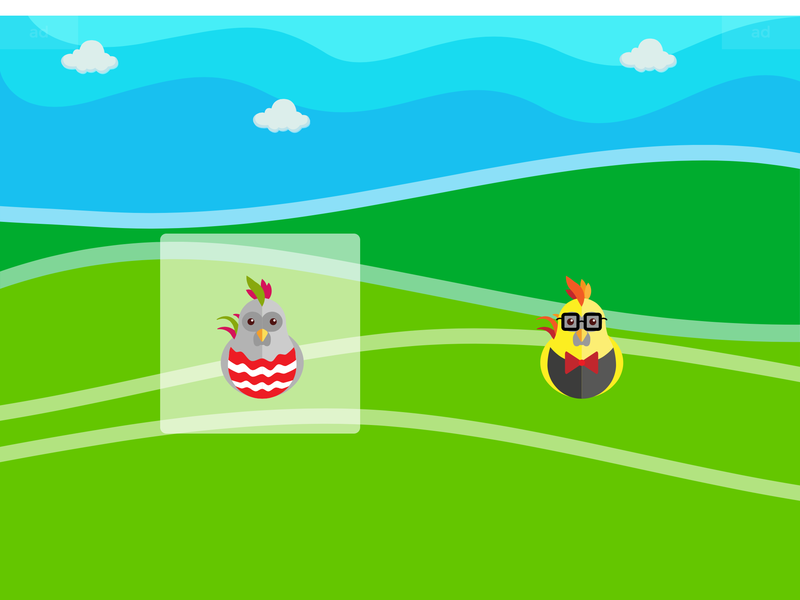 Chicken Game: This is a Corsi block test where the stimuli are chickens that pop out of hutches, and the child taps on the hutches in the order that the the chickens appeared. The child is rewarded for each tap by hearing a chicken cackle and for a correct sequence by having the last chicken in the sequence lay an egg. Again, the rewards accumulate and show more and more eggs appearing in a haystack and field over multiple game runs. 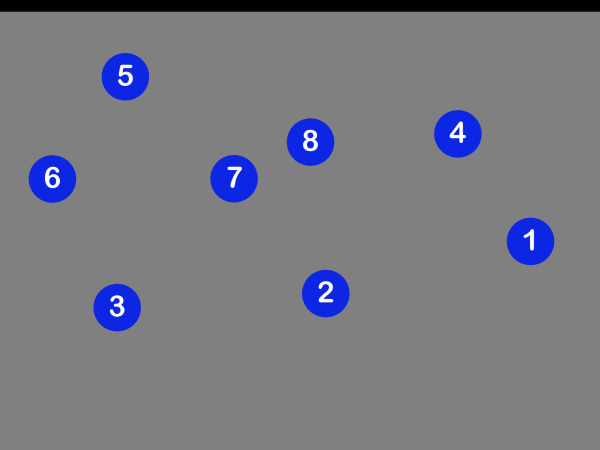 This game adapts by varying the number of chickens appearing in the sequence. 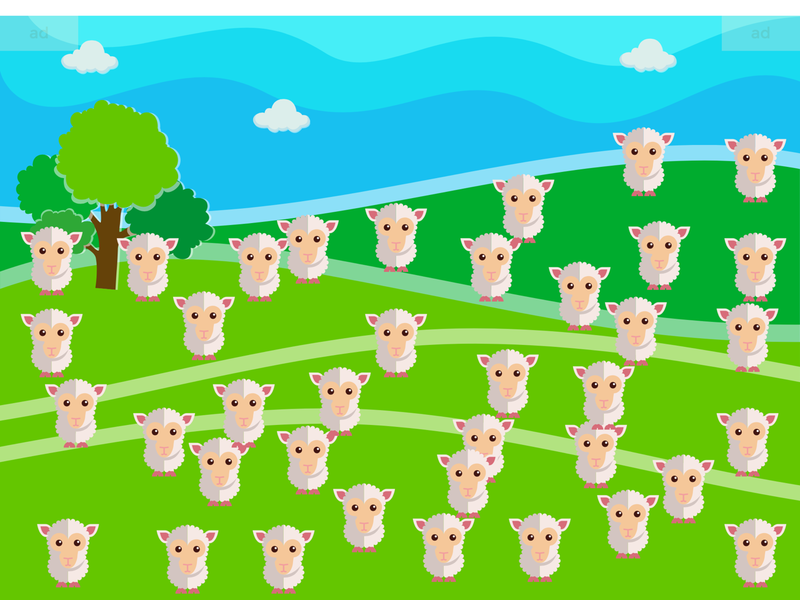 Memory Game: This game presents both sheep and chicken stimuli where half are targets seen in the previous runs of the Sheep and Chicken Games, and half are distractors that were not seen. To support this game required the design of 30 unique sheep and chickens varying in their accessories (e.g., colourful hats, monocles, mustaches). 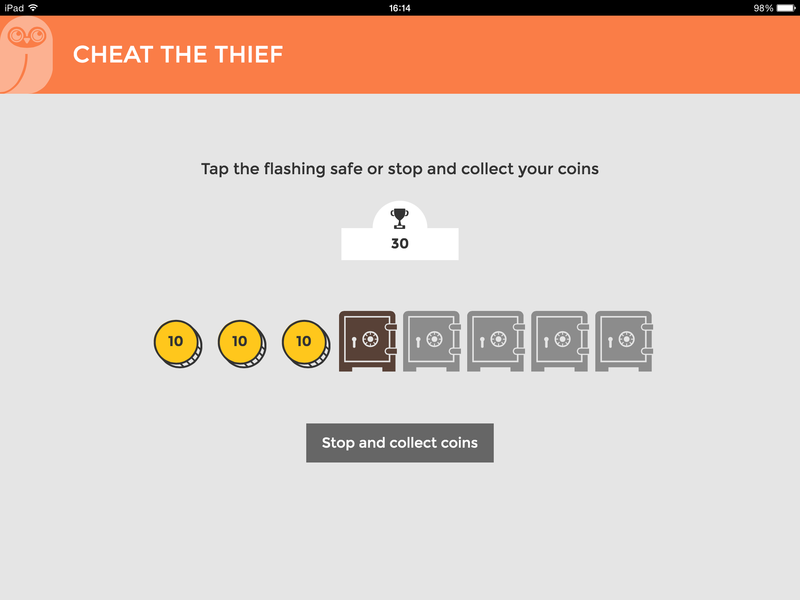 In this task, there is audio feedback when stimuli are tapped and rewards are shown after blocks of trials, but these are not based on performance. 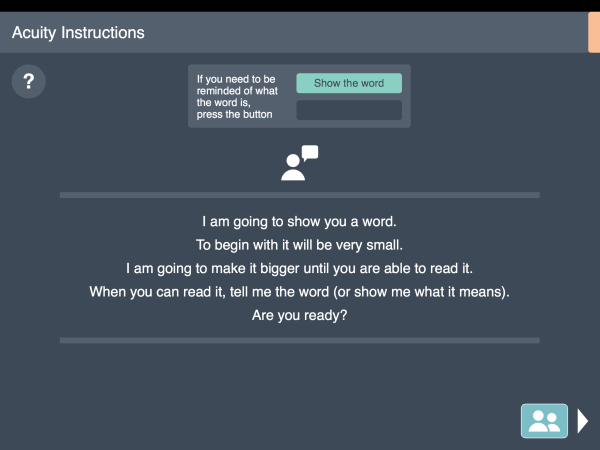 The application works in several modes: Child mode, where tasks use automatic transitions to remove the need for navigational buttons and use only audio feedback and no text; RA mode, where tasks are self-paced so that a research assistant can talk the child through the first session following a script; and Adult mode, where the adult can intervene in the game and read instructions off the screen if the child needs reminding of how to play the games. Hidden buttons on the game screens allow access to both the RA and Adult modes. As with many of our other applications, an administrative website gives the researchers the ability to upload settings files which control many aspects of the application and individual games. This website also allows data to be downloaded. The application works entirely in offline mode, an important feature as some households are thought to have poor or non-existent Internet connections. A strong and engaging graphic design that allows the application to be used with young children with intellectual disabilities. Use of alternative game modes allows the same application to be used by the child, a parent/adult and a research assistant. Adaptive elements of the games occur both within and between game sessions, allowing some phases to be skipped if subsequent runs of the same game occur closely in time. An administrative website which allows the researchers to upload settings files and to download data. 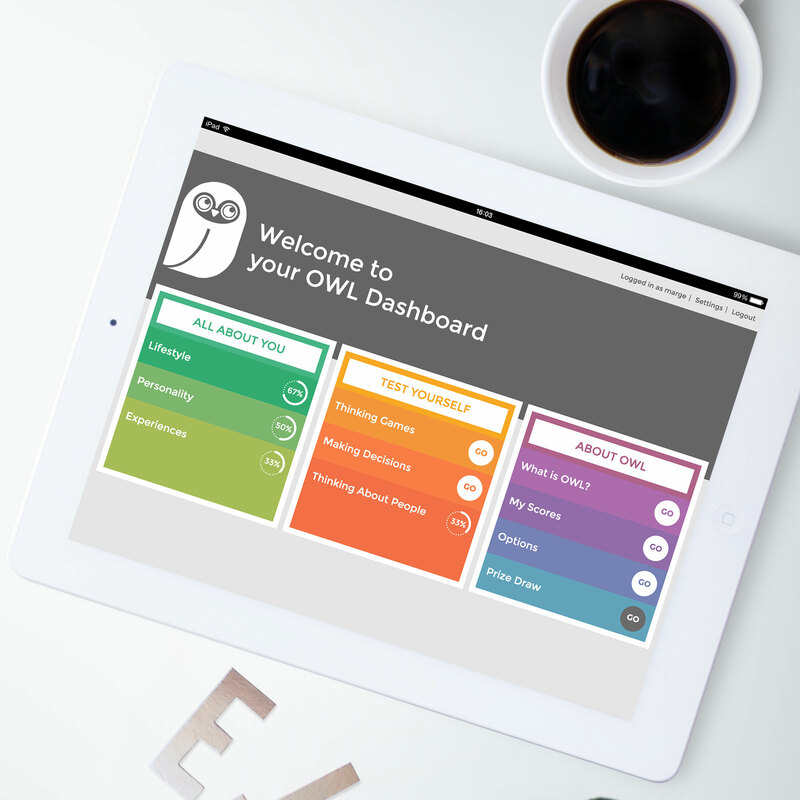 The aim of this project was to build a web application that will help researchers learn about changes in thinking skills, decision making and health behaviour during adulthood. We built an application that can be installed on both Android and Apple tablets and phones from a website hosted at the university (see Online Wisdom Lab). 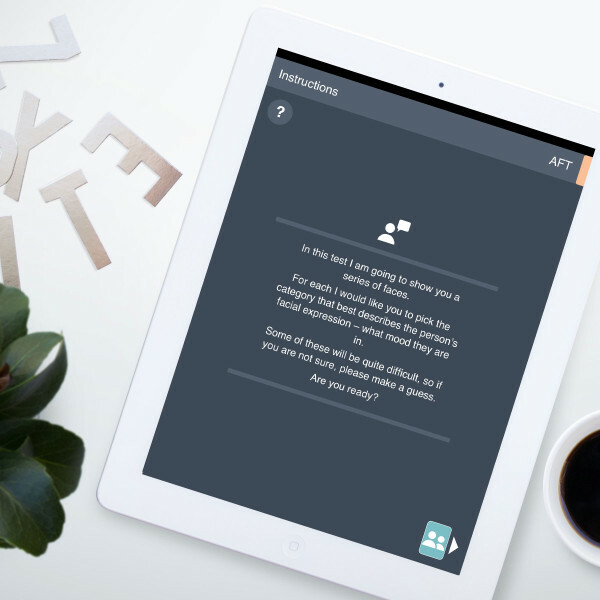 The application includes 10 different surveys on lifestyle, personality and experiences and 12 games on thinking style, making decisions and thinking about people. Each test records data on a variety of measures, some using adaptive algorithms to adjust test parameters based on the participant’s performance. 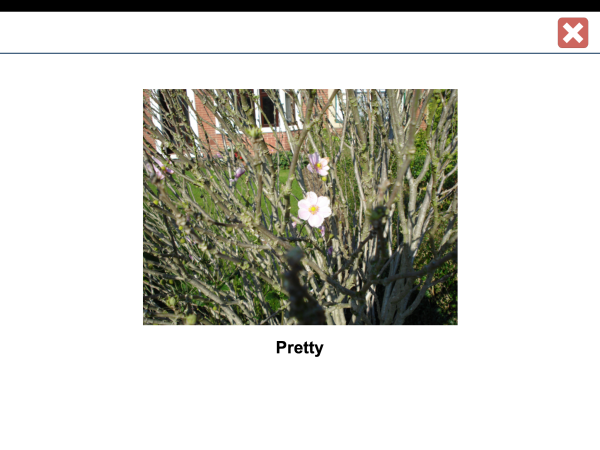 Other tests require tight control over the presentation of stimuli on the screen. 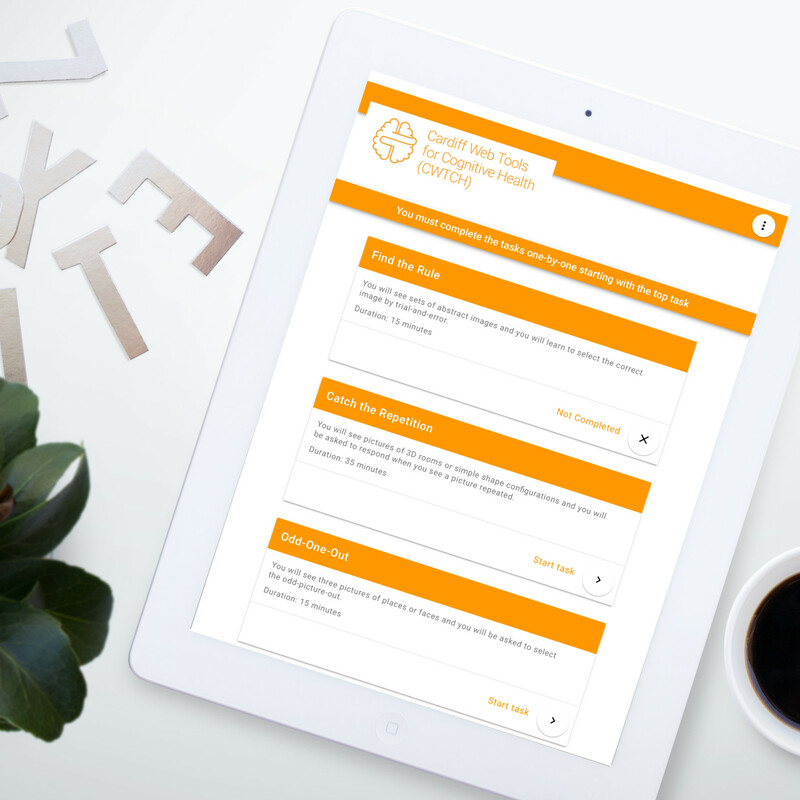 Feedback on performance is provided within the application in various ways, including graphical representations of survey results and a scoreboard of each participant’s scores on completed tests. The tests can be run while off-line, and the data are stored locally on the tablet or phone until the device is connected to the Internet. A cross-platform and installable web application that is fully responsive and adapts to both smartphones and tablets. The application runs in both on-line and off-line modes. Tests that adapt based on the participant’s performance. Performance is optimised to enable rapid presentation of stimuli. 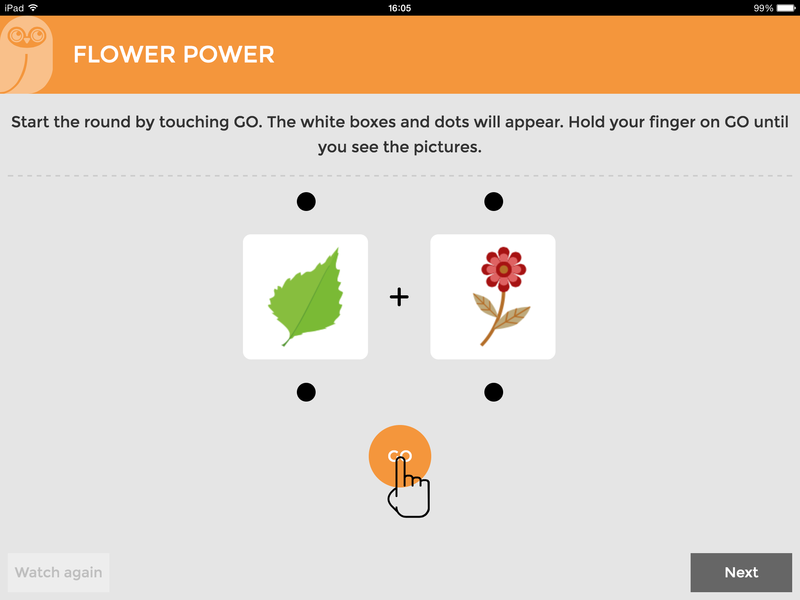 Maximises the capabilities of touch-screens to track finger movements on the screen and to present movement-specific feedback to the participants. An administrative website that allows the researchers to upload task parameters and download results. The aim of this project was to build a web application to provide a rapid screen of cognitive function. The tests included in the screen cover a wide variety of cognitive functions and are based on a wealth of psychological research. We built an installable web application that can be run on any modern browser on a variety of touch-screen tablet devices, and can run without being connected to the Internet. 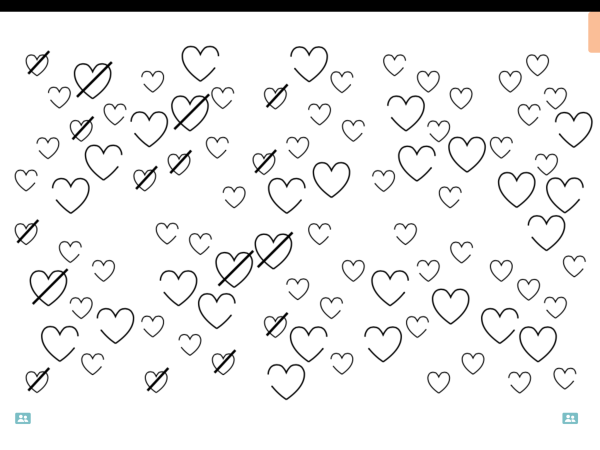 The application runs through a series of tests in a recommended order, including tests that measure reaction times, present video and that capture the participant’s handwriting. The data are stored locally on the device and are then securely uploaded to a server where the results can be downloaded and viewed. An installable web application that can be run in both on-line and off-line modes. A single application that runs on any modern browser on iPads, Windows and Android tablets. 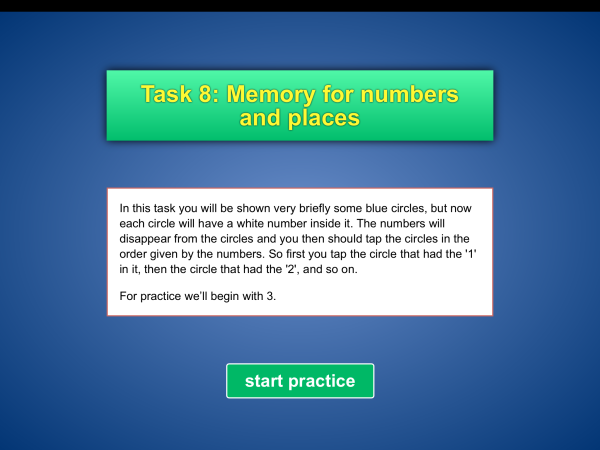 A wide variety of cognitive tasks that adapt based on a participant’s performance. In-application administration instructions that adapt for experienced and novice testers. Automatic and secure upload of data to a remote server. This project is part of a programme of research that examines how changes in thinking style relate to symptoms of depression and anxiety. We built two components to support this research: the first is an installable web application that can be run off-line on any modern browser on a variety of touch-screen tablet devices; and the second is an administrator’s website that controls the behaviour of the web application. 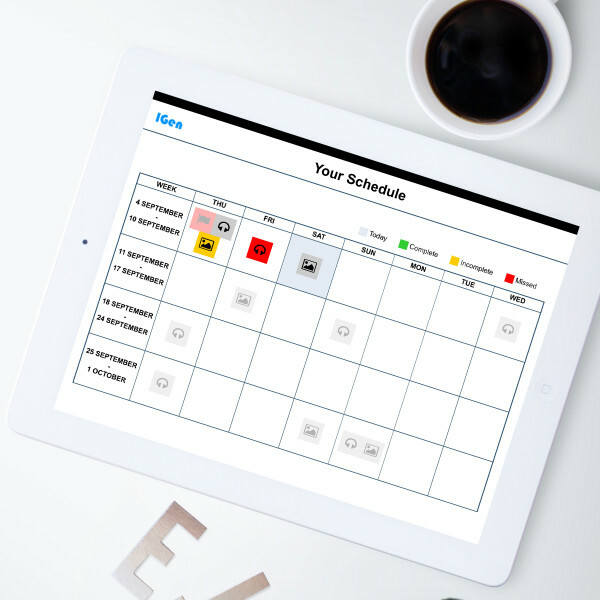 The application delivers a schedule of training sessions over a period of several weeks. Each session presents a number of picture or auditory “scenarios” which are arranged into blocks. Participants are asked to close their eyes and imagine, and then rate the vividness of their image. Data are recorded locally on the tablet, and then automatically uploaded to a remote server. The administrator’s website allows the researcher to control many aspects of how the research study is run and how the web application behaves. 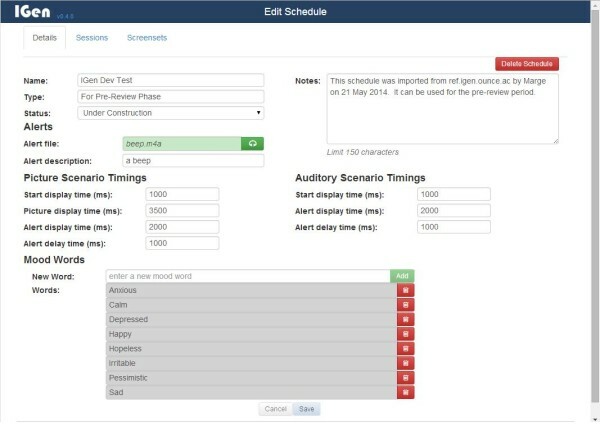 So, for example, the researcher can create new projects, schedules and sessions; assign participants to a schedule; upload images and audio files; edit the text on individual screens in the application; control the timing and order of presentation of the screens; download data for participants, and more. A researcher’s website that can be used to create and customise training schedules for a number of different imagery generation projects. An installable web application that delivers training sessions and includes the presentation of both image and audio stimuli and the collection of participants’ responses. Sessions can be run while off-line, and data are uploaded when an Internet connection is made. Data are uploaded to the server automatically and are then stored on the server in a format that can be easily used in an analysis package. This project investigates whether training people on particular short-term memory tasks will lead to more general improvements in short-term memory. We built two applications to support this research — both are installable web applications optimised for the iPad. The first application, which is run in the lab, runs through eight short-term memory tests that establish baseline data for each participant before they start training. The second application provides training in one of four different tasks; this will be run by participants in their own homes. The training program adapts to changes in performance and is organised into daily sessions of a variable number of blocks. Performance feedback is presented after each block and session. Data are recorded locally on the iPad and are then automatically uploaded to a remote server. Each application is heavily parameterised, and the code is organised to make it easy for the researchers to change the values of almost every key variable in the tasks, including: item presentation times, trials per block, sizes of stimuli used, etc. This means that the researchers will be able to alter these parameters themselves without needing to come back to us for more coding. Two separate installable applications with participant ids used to link data across applications. Tasks can run while off-line, and data are uploaded when an Internet connection is made. The tasks are heavily parameterised so researchers can make changes to key variables themselves. Data are securely uploaded to the server automatically and are then stored on the server in a format that can be easily used in an analysis package. © 2014 Ounce Technology Ltd.
All Rights Reserved. In England and Wales Number 07368195. Registered Office: The Sycamores, 43 Kneesworth Street, Royston, Herts, SG8 5AB, UK.